Since the mid-1980’s people have added CES (cranial electro-stimulation) as a third modality while doing light and sound sessions. For those who are unaware of what CES is; the units are most often driven by a 9 Volt battery and the machine is about the size of the palm of your hand. An electrode cable extending out of the unit has left and right leads. Some use ear clips, while others use adhesive pads that adhere on a spot behind the ear, in front of the ear, or the temporal lobe. The Oasis Pro and Delight Pro systems by Mind Alive utilize ear clips that attach to your earlobes dry. You can use any CES machine while using light and sound, it doesn't have to be a specially made model. CES basically stimulates the brain to produce serotonin, which then triggers a "domino effect" amongst other neurotransmitters. The precise effects are individual because everyone's brain chemistry is different. 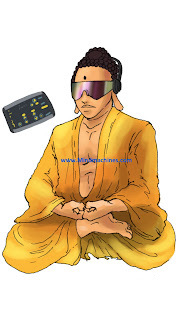 However, using CES at 100Hz appears to generally calm and relax most individuals who utilize that specific frequency. The CES device I first used was the original Oasis by Mind Alive. One day a friend brought his Oasis CES unit over, thinking it could help people with cocaine addiction. In the early 1980’s cocaine was the drug of choice for many people. That first time I tried a thirty-minute session and felt much less nervousness, much more relaxed than before I tried it. I have used CES on many occasions since then because it works like a dream when you are "on edge." About the same time, Michael Hutchison’s book “Megabrain” had just been released and people became more aware of the variety of ways they could apply brainwave frequency entrainment technology and also how all these emerging technologies could be combined. Light and sound and CES became permanently intertwined. CES is very simple to use, extremely effective and is the number one choice for alleviating stress, getting to sleep, life changes and in general, making a good thing better. The DAVID Delight Pro generates a unique fusion of audio-visual entrainment (also known as brainwave entrainment) and cranial electro stimulation (CES) with sophistication and simplicity. The built-in light, sound and CES programs of the Delight Pro and also the Oasis Pro have been designed and thoroughly tested based on the most current research findings to ensure the most effective results. The programs on the Delight Pro are supported by research studies which include Seasonal Affective Disorder, stress reduction, insomnia, improved mood, mental sharpness and balance (reduced risk of falling) in seniors, and reduced worry, plus improvements in concentration and memory in college students. 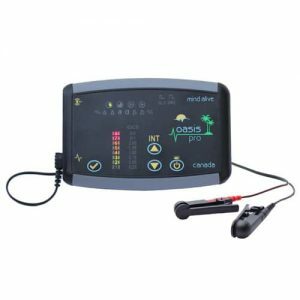 The Oasis Pro comes complete with the Oasis Pro unit, Stimulus Cable with Earclips, Carry case, 9-Volt Alkaline Battery and Comprehensive Operator’s Manual. 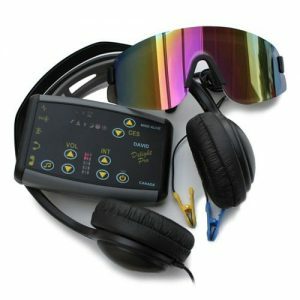 Each DAVID Delight Pro includes Tru-Vu OmniscreenTM Eyesets and Carry Case, Quality Stereo Headphones, Stereo Patch Cord, CES Earclip Stimulation Cable, DAVID Carry Bag, 9-Volt Alkaline Battery, AC Adapter and Comprehensive Operator’s Manual.